We cater for all type of jobs from one bedroom units to the largest of houses, shop fronts to large buildings. We will always map out a cleaning plan and schedule to suit your requirements. We have been providing cleaning services for over 12 years. We pride ourselves on our high level of service. 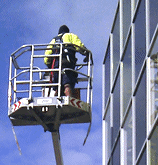 Commercial and domestic window cleaning using modern technologies and best practise safety procedures. Fill in our on-line form for a no obligation free window cleaning quotation and cleaning plan.